Full-scale television coverage of national party conventions began in 1952, turning what had been a gathering of party leaders and faithful supporters into a media event on view for a much broader audience. Convention sessions were reorganized to occur largely in the evening hours – the peak viewing times for the at-home audience – and the schedule of events was tightened. That same year, the conventions began to occur in the months of July and August. The number of delegates in attendance at each party’s convention varies from year to year, and has steadily grown since the introduction of these events in the 19th century. In 2000, the Democratic National Convention hosted 4,337 delegates and 610 alternates; the Republican National Convention hosted 2,066 delegates and an equal number of alternates. Delegates are often seen carrying signs and wearing outlandish outfits to draw increased attention to their candidate, especially to the viewers at home. 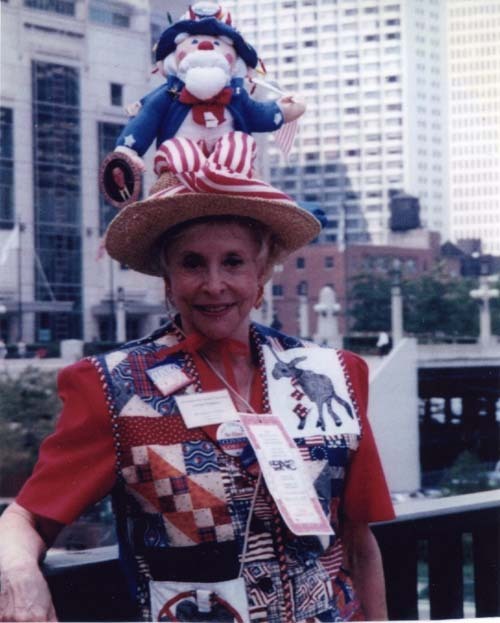 Maxine Goldstein: “The Hat Lady" Born in 1926, Maxine Goldstein has been an active volunteer in the Democratic Party since the 1960s. She has held positions on both the state and national level, serving on the National Convention Site Committee in 1988. As of 2008, she has been a delegate at the last eleven Democratic national conventions and was a presidential elector in 1980. Mrs. Goldstein has become famous as the “Hat Lady” for the elaborate hats she creates to wear at the conventions, such as the donkey-topped hat she wore at the 1984 National Democratic Convention, complete with batteries for activating the donkey, and the “green peanut” hat she wore at her first convention in 1976. 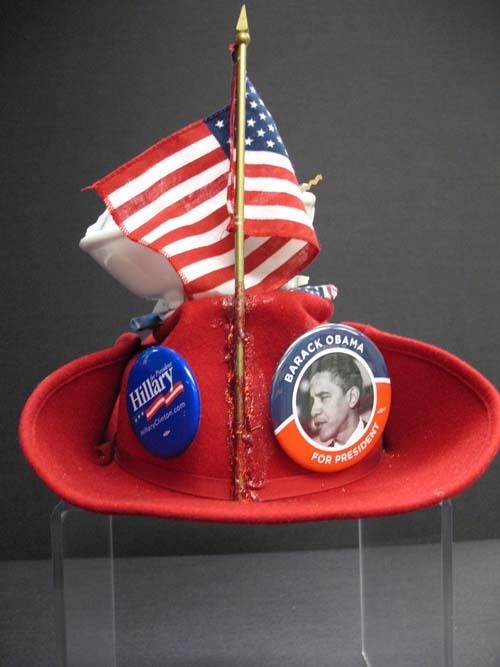 This month we display the Hat Lady's most recent creation: A red cowboy hat Goldstein sported at the 2008 Democratic National Convention in Denver, Colorado. 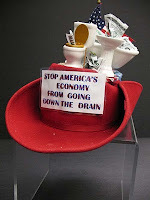 The top of the hat is adorned with a miniature bathroom set. Faux dollar bills are stuffed down various drains, and a sign across the front proclaims “Stop America’s Economy From Going Down the Drain.” The back of the hat reveals campaign buttons in support of both Barack Obama and Hillary Clinton. 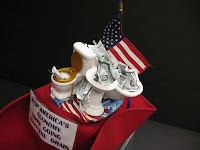 May’s “Outside the Box” object will be on display in the lobby gallery of the Russell Library, open 8:30 am – 4:30 pm, Monday through Friday, until May 31st. For further information on this feature, or the Maxine Goldstein Papers, please contact russlib@uga.edu or visit http://www.libs.uga.edu/russell.